“There’s far too much drinking to be believable, particularly by page 167 when Joanna is in considerable danger and needs to keep alert!” My man looks very headmasterish as he comments on ‘The Bolivian Connection.’ “Despite that it’s a really good read June, well done.” I feel quite emotional when he says this, almost to the point of crying with joy. “If it’s just a matter of drinking a bit less, I’m sure I can change that, well at least a little.” I blubber, my chest full of pride in my finished book. “Ah, well, I’ve sent you an email with my other comments.” he grins, “Nothing serious though.” “Thank god” I say, “let’s have another glass of wine!” My man had returned from a few business days in London and had been reading my first draft in his spare time. Then yesterday, Saturday, he managed to finish the whole manuscript, bless him. 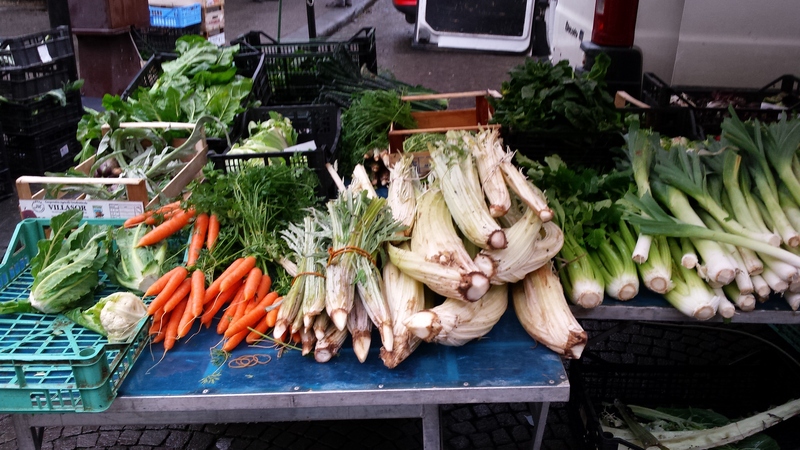 Lovely home grown veg in Certaldo Market. Having my man back home makes everything that much more enjoyable, going for morning coffee and even shopping for fruit and veg in Certaldo on Saturday morning. 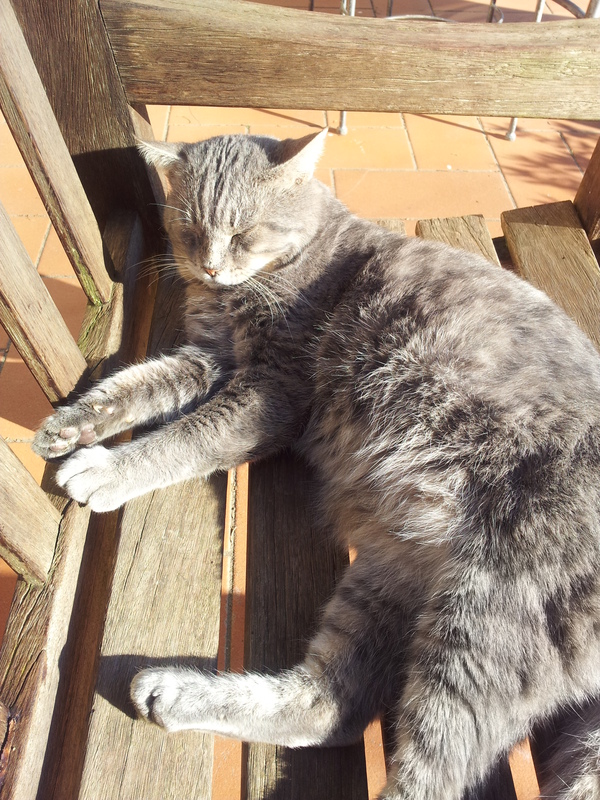 Farty Barty the cat loves it too and stretched out in the sunshine on the garden bench, whilst we were enjoying a pre-lunch drink. So, I had been home alone last week and had to go to a specialist appointment on the Tuesday by myself. I emphasise this point, because, whilst I survive on my own, you can guarantee that something will throw me out when the man is away. I arrived at the hospital in Castelfiorentino and found a new system had been installed. I needed a special ticket from a machine and then wait for my number to be called. On a computer screen it told me which room to go to, so I trotted off. Now you should understand that this is simply to register that I have arrived in the building and to pay for the consultation. OK, so two jolly ladies register me, take my money and give me a receipt. Then I was sure she said, in Italian of course, “You are in the wrong building, we are just a skeleton staff, everything has moved to the centre of town.” By this time I only have five minutes to get to the specialist. In broken English, the other lady gave me directions, so off I went. Ten minutes later I park in the main Piazza, as I was sure that was where I had been sent. But to make sure I walk over to a bench of old boys, whose grins get wider as I approach. I focus on the one in the centre who’s looks the least lecherous and show him the address I have to go to. Proudly, he pulls himself up with his walking stick and stands looking up at me. “I will take you there, Signora, follow me.” So of we go, the sun is shining and for once Castelfiorentino looks attractive and welcoming. Fifteen minutes later, my knees are killing me and I am about to suggest that we sit and take a rest, but we had arrived. I’m not sure whether to offer him a few euros for his trouble, but he is disgusted with the idea, so I shake his hand and he heads back to his friends. I am twenty minutes late for my appointment, but this being Italy, I am kept waiting anyway. All I can think about is the long walk back to the car! 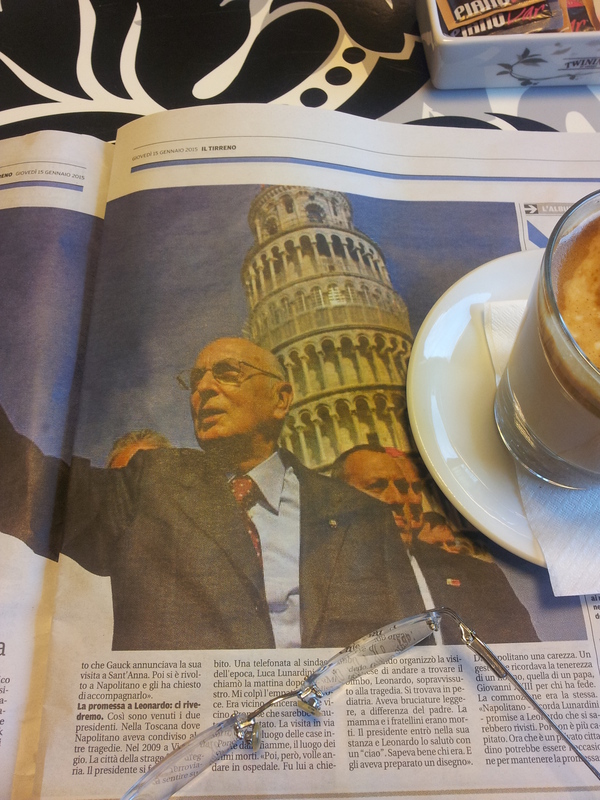 Talking about old boys, last Thursday I was joined by our Presidente Giorgio Napolitano for coffee at Laura’s Bar/alimentare in Fiano. Well, he was in Pisa at the time, but I like to feel these people are right next to me as I read about them in the paper. He has finally decided to retire and has cited his age of eighty-nine as the deciding factor. I say, good for you that man, enough pf politics, go and put your feet up somewhere warm to celebrate your forthcoming birthday. Why not ask Silvio Berlusconi to organise the party. On the other hand, how strong is your heart these days? Perhaps something a little less energetic would be more appropriate. Well, must go and make myself beautiful as we are off to lunch at ‘C’era Una Volta’ as Paolo is back after a bout of flu. Have a really great week, and do drop me a line.